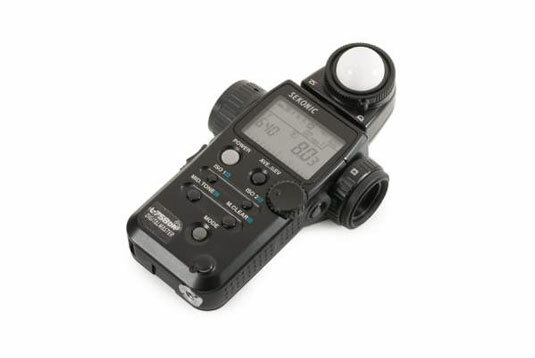 An external light meter (most often simply referred to as a light meter) is a separate gizmo for your dSLR that measures the amount of light in a scene. That’s all it does. It doesn’t take pictures. More expensive light meters can measure reflected and incident light. Some light meters only measure incident light. While not strictly necessary, a light meter can be a valuable addition to your kit. Look up your light meter’s manual for specific instructions. In the meantime, here is a general sense of how they work. Turn on your light meter and set it up. Set the measuring mode, if necessary (some measure flash as well as ambient light). Extend the dome if you’re using the meter incident mode. If you’re using the meter in spot mode, sight what you want to meter through the meter’s eyepiece before you press the measure button, and you can keep the light dome retracted. Select the shooting mode that lets you enter the setting you want fixed. For example, if you want to set the meter to use f/8 as the aperture, set the meter to Aperture priority mode. This has nothing to do with your camera. You won’t be using this mode anyway, as Aperture and Shutter priority modes on your camera are autoexposure modes. Enter the appropriate fixed value, such as the aperture or shutter speed, that you want to use. Hold the meter so that nothing is in its way. If you’re shooting a landscape, hold the light meter out or up to keep your body from blocking the light. If you’re shooting a portrait, go over to your subject and hold the meter with the light dome pointing towards the camera. If necessary, press the measure button. Read the measured exposure setting value. This isn’t the setting you entered in Step 3. It will be the floating exposure setting that you haven’t accounted for. Switch to Manual mode on your camera and enter the values indicated by the light meter.